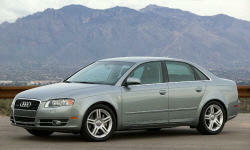 Why the 2008 Audi RS4? Superb V8 that revs like the dickens all the way to 8k rpm. Stock tuning is a bit weird when not in Sport mode, as you can really feel the power being limited down low. The throttle is extremely responsive in Sport mode, and really adds a sense of urgency when driving. I only test drove the M3, but the two engines seem to be pretty similar. I'd give the nod to the Audi V8 for a bit more torque and rev-happiness. The Audi V8 also has a much throatier, deeper sound. The M3 sounds almost artificial in comparison. Shifter felt a bit long and sloppy at first, but I was coming from a Miata with a short throw kit, so that was to be expected. As I've gotten used to the car, I've found the throws to be perfectly acceptable, and while the shifter may not engage as positively as I'd like, there is still enough feel and positive engagement for those looking for it. The shifter in the M3 is absolutely shameful. It seems BMW has focused all their efforts on the DCT transmission, as the shifter in the BMW wouldn't have been out of place in my dad's Dodge Ram. Handling is superb, as one can expect from quattro Gmbh. Planted and secure are the first two words that come to mind. Very responsive direct steering feel. Very firm ride that isn't helped by the 19" wheels. I feel like 18s would have been a better compromise between ride quality and handling. That said, it's certainly more than acceptable considering what the car is designed to do and how capable it is. Seats are equally superb, if a bit cramped in the back. Much nicer than the M3 seats, with better bolstering, and higher quality leather compared to BMWs "leather" interiors. While not necessarily the vaunted "cockpit" interior that is supposedly the gold standard for sports cars, the interior is a notch or two better than the M3s and doesn't seem to slope away from the driver. Quality of materials, as well as overall layout seem to be just a touch better than the M3s implimentation. Whereas the M3 interior might be described as modern and minimalist, the Audi interior feels more tech-y. EPA ratings are accurate. I've seen as low as 12 mpg in the city, and up to 22 mpg on highway journies. I average 15 mpg in mostly-city driving. Subtle exterior styling. Flared wheel arches and side skirts let you know that it's not your everyday A4. A pair of 'RS4' and 'V8' badges and oval tailpipes are the only other clues to let you know that it's a 420 hp animal. Compared to the M3, it's restrained. No hood bulges, side vents, or carbon fiber roof. Why Not the 2008 Audi RS4? It's an AWD car, so all 4 tires should really be replaced when one is damaged. Audi says that 4/32" is acceptable tolerance, but I feel like it's cheap insurance compared to possibly damaging the AWD system. This is the only time in your life you will think 4 Michelin Pilot Super Sports are cheap. Rear seats seem very cramped for leg room. I've never used them, but have only ever dared to take adults on short trips in the back. Heated seats are available for the rear passengers. Since the seats are so heavily bolstered, you really have to be in the driving position Audi deems correct to be really comfortable. Thigh supports really help alleviate pain during long road trips. Also, I've never been able to find a position for the lumbar support that I like. OEM replacement wheels are about $800. Each. If an OEM wheel gets bent, the aftermarket is going to be cheaper to replace them as long as you don't mind not having the OEM look anymore. Other than that, all other maintenance costs and parts seem to be pretty much in line with other cars of this caliber. Great car, capable in snow, extremely planted on tarmac. In my opinion, it's a much more refined and complete package than the M3. Honestly, the fly in the M3s ointment was that horrible shifter. If you're after the DCT, the two cars might be more competitive, but as a 3-pedal devotee the RS4 is the clear winner.